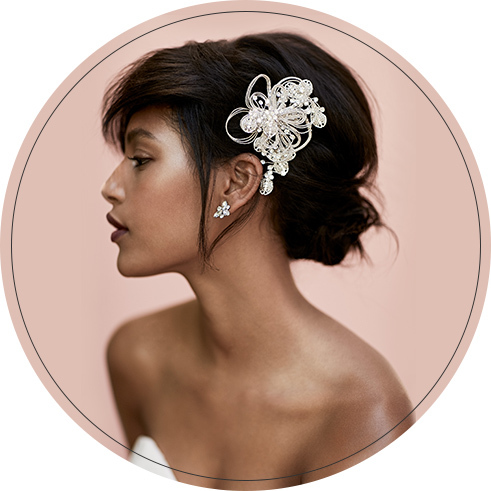 Everything you want to know about the definitive bridal accessory. 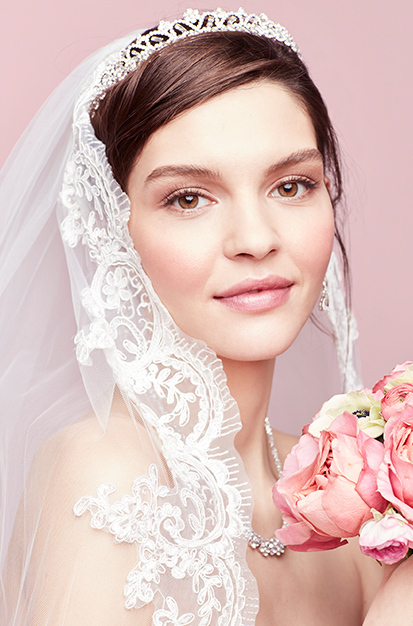 Meet with a stylist We'd love to help you find the perfect veil for your look. 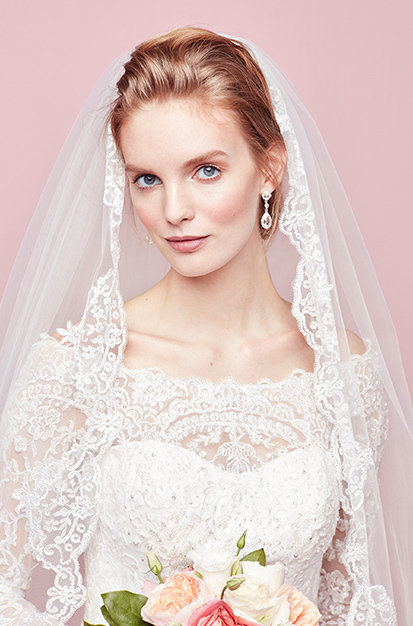 A cathedral veil delivers an unforgettable statement that's classic and a touch regal. With more than 250 centimetres of fabric extending from the comb, your veil will trail gracefully beyond your dress's train as you move. Mid-length veils, including elbow-length, fingertip, and walking veils, outline the upper body for a flattering silhouette. This option provides a traditional look but also works with tea-length dresses and alternative bridal styles. A birdcage veil covers only part of the face and is attached to either a headband or a comb. Often made with fishnet-patterned Russian tulle, this style gives off a vintage vibe that juxtaposes perfectly with modern wedding dresses, even jumpsuits. 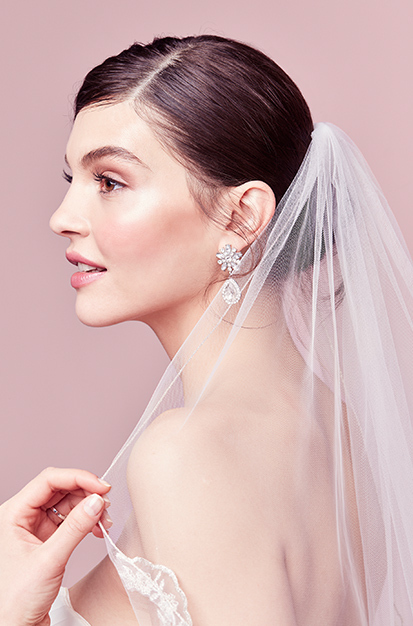 If you're dreaming of a big reveal during the ceremony, you'll want a blusher veil to conceal your face for your entrance and walk down the aisle. 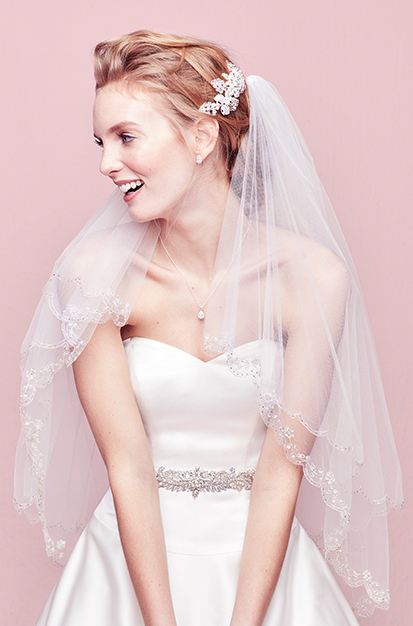 Pair this short veil with a longer veil worn down the back. 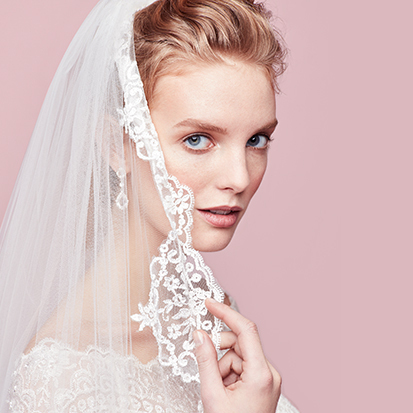 The circular, Spanish-style mantilla veil features a thicker lace trim along its edge. 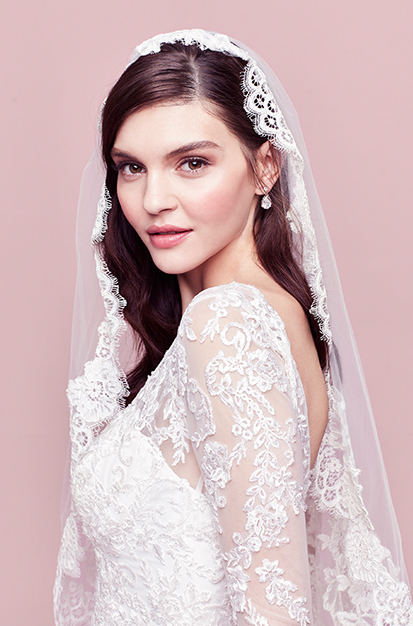 Softly drape the veil over your head (a hidden comb holds it in place), and the embellished border will frame your face for the prettiest effect. 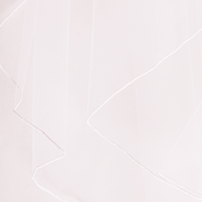 Veils come in a range of shades including white, ivory, champagne, and whisper pink. 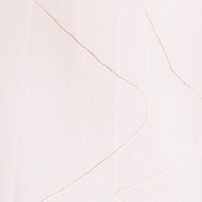 Match your wedding dress's colour if you can, or go with the one that's closest. 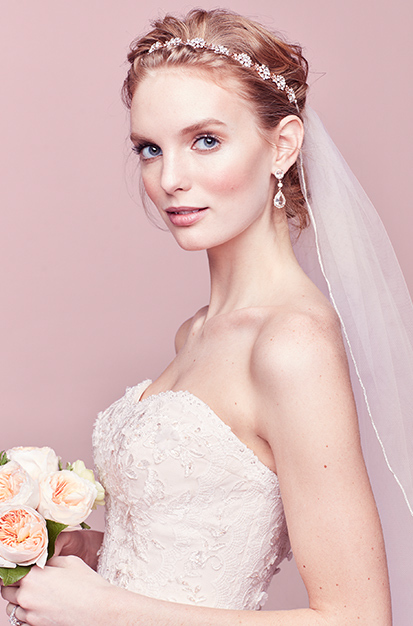 For gowns in soft tones like blue or blush, an ivory veil looks beautiful. The trim or beading on your veil doesn't have to mimic your dress's details perfectly, but it's lovely when they complement each other: metallic embroidery or statement lace on both, for example. Single-tier and multi-tier options allow you to select the level of volume that's right for your look. You can also double up on veils to create a completely custom two-tier effect with exactly the drama you desire. Keep your dress's key features in mind when you're selecting your veil. Low-back style? An unembellished veil lets that detail show through. Simple dress? 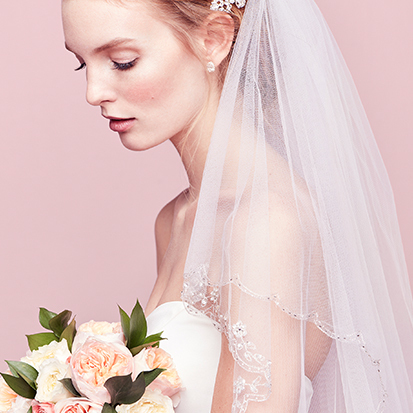 A crystal-trimmed veil brings a touch of opulence. 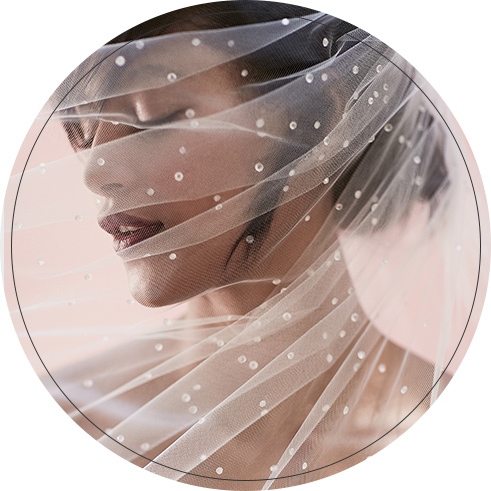 Moving your veil even a few centimetres or two can transform your whole look, so try out the different placements to see which way you prefer. 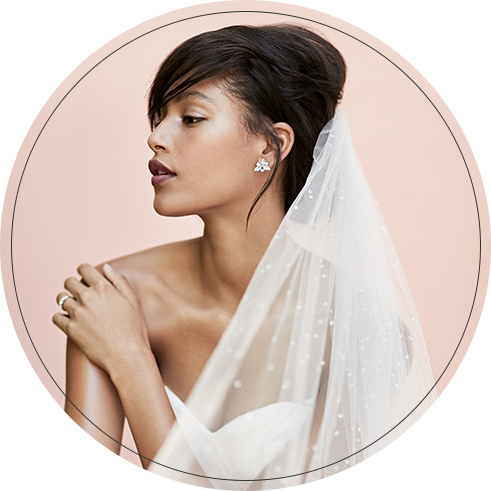 After the ceremony, swap your veil for a comb or halo that adds sparkle and won't get in your way on the dance floor.